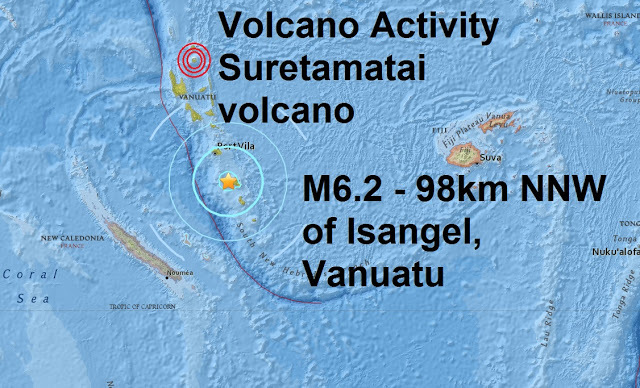 A magnitude 6.2 - 98km NNW of Isangel, Vanuatu is the 8th major quake of June and the 73rd of 2016, meanwile further north, seismic activity from the Suretamatai volcano has scientists worried of a new eruption. The alert level of the volcano (also known as Vanua Lava) was recently raised a notch from 0 to 1 (on a scale of 0-4). No details about volcanic unrest are available, but presumably, the Vanuatu Geohazards Observatory recorded elevated seismic activity from the volcano. Residents and tourists are reminded to stay outside of areas near the crater and in particular avoid the Sulfur River (E flank) were there is a high risk of volcanic gas emissions.